Gensets that operate at different frequencies as well as different voltages are special units whose design process has been thought out and revised all the way down to the very last detail. One of our latest orders comes from an international building company who needed gensets capable of being moved from one place to another and of operating at different frequencies and voltages, as the client has construction projects in different countries around the world. 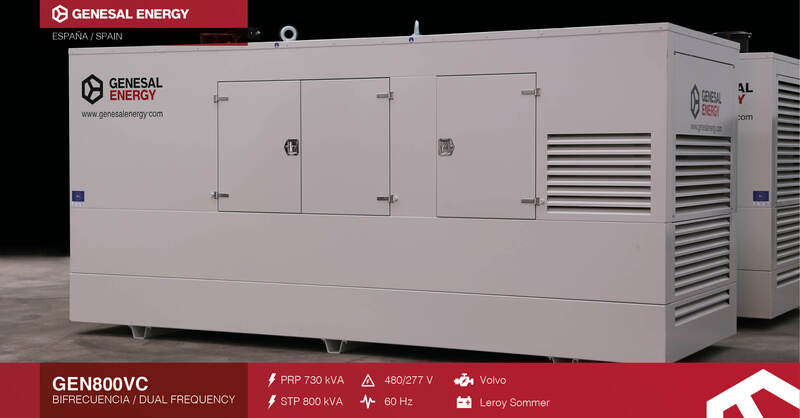 Gensets capable of being moved from one place to another and of working at different frequencies and voltages, as the client has construction projects in different countries around the world. 730-800 kVA units prepared to operate by manual and automatic start in the event of a mains failure, at 480/277 Vaz 60 Hz and 400/230 Vac 50 Hz. The change of voltage and frequency is carried out from the control panel with a switch for the adjustment of frequency and a potentiometer for the adjustment of voltage. At the same time as the frequency is selected, the control panel is reprogrammed with the values corresponding to the selected voltage and frequency.